Never Ending 80's - 'Live' Like It's 1989! There’s no other decade like the 80s. It was THE era of BIG HAIR, BIG HITS and BIG FUN. NEVER ENDING 80s take you back to Party Like Its 1989 with a night packed full of the biggest hits by the biggest artists ever. 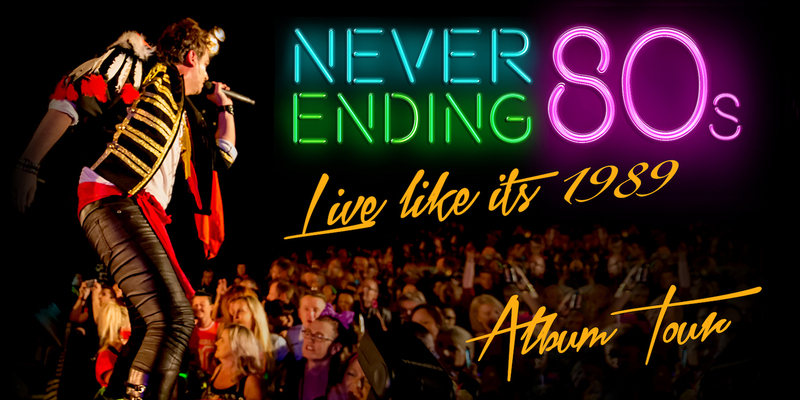 The Decade that was the 80s was awesome and with that decade came with THE BEST soundtrack - Now, The Never Ending 80s band are bringing you that soundtrack recorded LIVE like its 1989!. The 17 track Album was recorded in front of 1500 screaming fans at Waves in Wollongong, as they carve their way through the music of Prince, Cyndi Lauper, INXS, Michael Jackson, Whitney Houston, as well as so many other giants, you’ll be dancing and singing along to all of your 80s tunes. LIKE TOTALLY..!